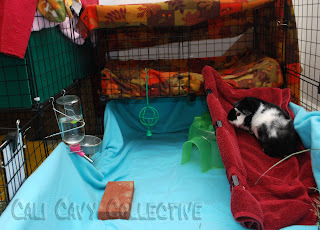 For those of you interested in guinea pig C and C cage layouts, Revy would like to show off her newly remodeled cage! 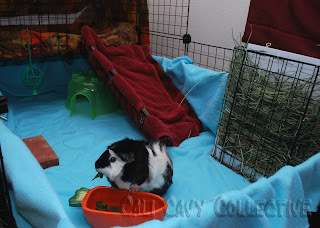 Our contractors (aka the humans) gave her cage an upgrade last weekend, adding in a second floor loft and ramp. She had to put down a sizeable piggy bean payment and borrow some from the neighboring pigs, but thinks it was well worth it. Our contractors expanded Revy's previous 2x4 grid C&C cage by adding in a 1x2 second level, bringing the total square footage of her cage up to about 15 square feet (not including the ramp). 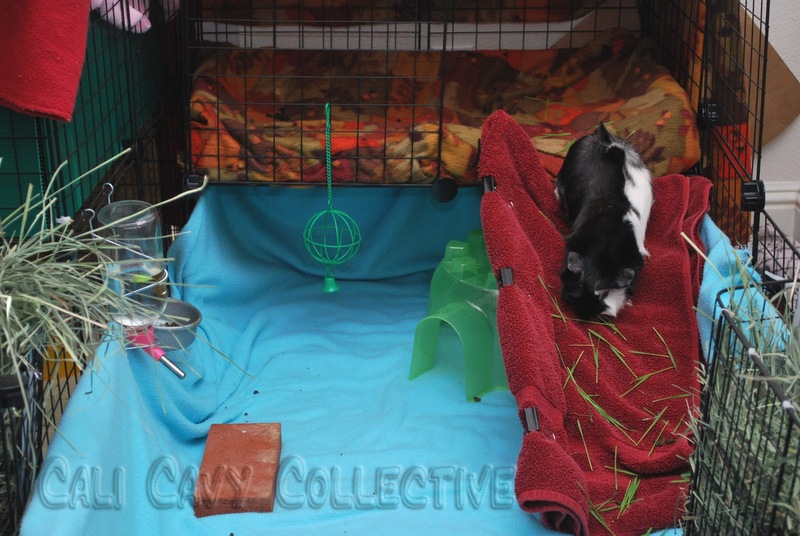 Since cavies like privacy, she requested a canopy for her loft, which the contractors kindly provided by draping fleece over the top. The ramp was made from two bent C&C grids, which were overlapped then secured with zip ties. Our humans used binder clips to secure the towel to the ramp. 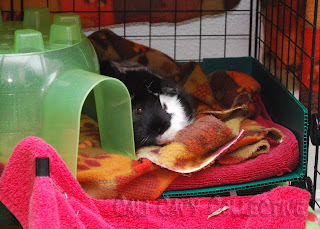 For bedding, she has the usual towels layered underneath anti pill fleece. Of course, Revy's home boasts all the usual piggy necessities - vertical hay rack, food bowls, pigloo and water bottle with brick. 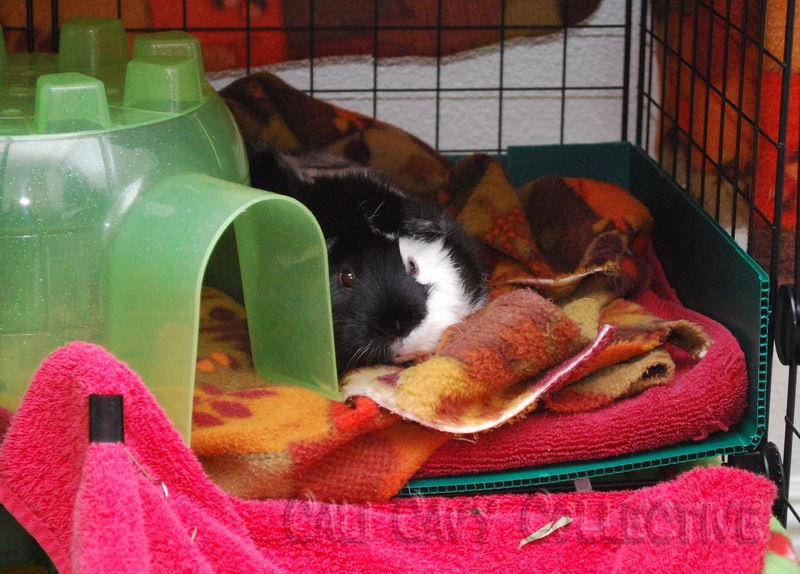 She also has room to hang her veggie treat ball, and can opt to fit in even more toys with ample room to bounce around. 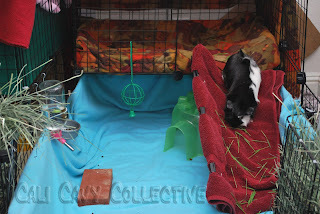 The contractors also made sure that she was able to keep her viewing window into the other cage where the rest of us cavies live. 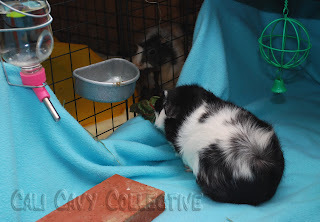 Although Revy has lived with us for over half a year now, she is a strong minded piggy who does not like to share so the viewing window allows her to interact with us on her own terms.